It’s possibly the densest concentration of volcanoes in the world, some as high as 4km and we didn’t even know these existed til recently. Despite that overwhelming ignorance, we’re 97.00% certain that all the warming in Antarctica is due to your car and airconditioner. Robin McKie, The Guardian writer, talks about the recent discovery of so many volcanoes under the ice. Not surprisingly, we have no data on how active these volcanoes are. However because we *know* climate change is definitely wrecking Antarctica, it follows that your car, air conditioner and pet dog could melt more ice, take the pressure off the tectonic plate and set one off. Then things will really get out of hand. Anyhow, it’s just a coincidence that all the warming in Antarctica is where the volcanoes are. These newly discovered volcanoes range in height from 100 to 3,850 metres. All are covered in ice, which sometimes lies in layers that are more than 4km thick in the region. These active peaks are concentrated in a region known as the west Antarctic rift system, which stretches 3,500km from Antarctica’s Ross ice shelf to the Antarctic peninsula. I’ve already heard the claims that Co2 causes earthquakes but volcanoes , if they stretch it any further it will drop off . TBH its really quite simple. Based on dodgy proxy data and even more dodgy models it has been shown Antarctica is losing ice mass. This allows the crust beneath to rise creating stressors in the surrounding areas leading to volcanoes. This change occurred during the great revisionist ear which began in 1984. Two other examples are the re writing of the second law of thermodynamics thereby allowing the IPCC to state the cold atmosphere warms the warm surface. We also had Al Gore re write the ice core history in his cult flick by stating co2 drives the temp. What can be “west Antarctic” each and every distance from the ‘South pole’ must be ‘North’ by definition! Where the hell can be West! West can never be a location but only a direction counter to the rotation of Earth. The south pole (dance) is where lady Penguins show their stuff! Many male Penguins drinking beer while having something/anything ridged. Will, dear boy, it’s all relative with reference to the longitudinal ‘line’ of 0°, the Greenwich meridian. It stretches from the North Pole, through Greenwich (observatory) in London, to the South Pole. Stand anywhere on the meridian (conceptually) and face North. Then everything to your left, namely from 364° 59′ 59.9″ longitude and less, is due west of it. Now you know. Ok but that is again a direction never a location! If the human reference were time of day, Solar static, all would much more comprehensible. Noon is the Sun at apogee, midnight is perigee (other way) at any location quite independent of seasons or axial tilt from planar orbit. Now west is later and east is earlier than ‘NOW’ anywhere on Earth. For the JONova site Earth’s atmosphere always has a huge stationary bulge in the direction of the Sun. This must be for any planet with surface atmospheric pressure above 20 kPa. Understanding this simple solid geometry is key to figuring out local weather and anything that may be considered climate, or climate change! Usuns are so stupid! This is all deliciously ironic. Some years ago “climate scientists” deduced ice caps were dwindling based on the changes in gravitational changes in the crust using grace data. Their hypothesis was as the caps dwindled in a warming world the land mass under the caps would inturn move thus causing the changes measured, from this they deduced how much ice mass was melting triggering a new cry for funding as more research was needed. Of course another phenomenon could cause a fluctuation in gravity fields and this phenomenon is called crustal lava flows and whattyyaknow 91 volcanoes and counting. Indeed! You can only counter that with satire,or ridicule, never science which must remain maybe! Ha, `science’ is not necessary, Real Life™ has had the temerity to amply disprove the `Ice is melting and we’re all gonna die!” fallacy with, as you so well put it, delicious irony. The search for Glacier Girl, and its discovery and recovery amply demonstrated that the Greenland ice cap was not melting, but growing; it was actually gaining mass—A Very Inconvenient Fact©. Short Story fast: the Lockheed P38 aircraft, now restored and flying, was crash landed, along with some others and some B17 bombers, on top of the Greenland ice in 1942. It was rediscovered in 1988, 79 metres (268 feet) below the surface of the ice. By the time it was brought to the surface in 1992, the ice covering had grown another 3 metres, to 82m. Images for the curious. So much for Greenland’s `melting’ ice. The planes didn’t melt their way down there. It was purely burial by 49 years of ice cap mass gain. Indeed! science is not necessary but must remain skeptical of any that claim to ‘know’! We can wind a$$ or scratch watch! Nothing further. So what “crustal lava flows” do you have evidence of, Crackers? Would you like me to serve the information to you on a silver spoon CT? In Africa and Australia, decreases in gravity are evidence of drying river basins. GRACE not only measures changes in water above ground — in rivers, lakes and reservoirs — but also senses the amount of water stored in aquifers beneath the Earth’s surface. This kind of information can enable better management of scarce water resources. GRACE can also detect changes in Earth’s crust brought on by earthquakes, such as the 2004 tremor in the Indian Ocean that triggered the deadliest tsunami on record. The quake changed the density of the rock beneath the surrounding sea floor, which GRACE was able to see several months later as a change in gravity. So what have we learned here CT? 4, Flowing lava under the ice…..did I mention GRACE can measure flowing water under the surface? That’s all very interesting, Crackers, but, “what “crustal lava flows” do you have evidence of”? I am waiting for your response to my comment (36.2.1.1) on the last “Weekend Unthreaded” in which you made some incorrect statements regarding actions of the UK Government, without providing any substantiating evidence. I am not saying that you lied, but if you can provide evidence for what you claimed, it would remove all doubt. Climate Change volcanoes under 4km of ice? What’s next? Bleaching of coral reefs? Warming of oceans? Storms and floods and famine and the four horsemen of the Ecopolypse? (Delingpole) The Science is ‘in’. So this just cannot be true. We know everything and we know for certain without equivocation that the most evil gas in the world is Carbon Dioxide and that it is caused entirely by the industrial revolution and everything which happens on this planet is due to Carbon Dioxide. What is really unbelievable is that this was reported by the Guardian. Probably caused by Tony Abbott. Then there are the recalcitrant NZ glaciers increasing mass balance throughout the time CO2 has been increasing, it seems this harmless trace gas has been unfairly vilified. And that mass increase was caused by Barnaby Joyce. CAGW kind. Back to the drawing board for some homogenization. Interesting, they are blaming AGW for the sled being uncovered by melting ice cover, but no mention of how it came to have been buried under many metres of snow – did it dig its way down, or was it just as warm many years ago and the sled was on the surface then, as it is now? That is a most bizarre question. The sled was left on the surface and it got covered up. Now, the surface of the ice is dropping, revealing things that were previously covered up. Frank Zappa’s “Dinah mo hum” Ummm..” I gotta spot that’s hot and you ain’t been to it” yeah yeah. I had to keep checking to see if I wasn’t reading sci-fi classic, equal in thrilling adventure as “Decent to the Centre of the Earth”. Whoever wrote that needs to get another job, his talents are wasted at National Geographic. Much betterer than sci-fi, Greg – it’s ‘Cli-Sci’ – I think that might start to catch on thanks to Betheserf. You’ve used Steig et al 2010 for your warming map. O’Donnel et al 2011 showed that was produced with faulty maths. Using the real results shows a different picture. They are volcanoes. They sit under a mass of ice. This ice is squeezing them and the material around them. They are volcanoes. They retaliate by becoming active. This volcanic activism can take a number of forms. Lava get’s squeezed out like a pimple or the contents of Toothpaste from a tube. Alternatively, this volcanic activism can go off with a bang. Then there is the fact that this volcanic activism can and does occur in cycles, depending on the potential triggers and current volcanic status, which as often admitted by nearly all Volcanologists, is not well understood. This then makes both scenarios potentially true, within a margin of error, depending on the time the measurements were taken, in any particular year. So nothing is known about the weather What is wrong with accurate “I do not yet know”, Rather than useless political claim of impending doom? It’s just scary enough. CAGW is all about ` The End of the World,’ hence the claim of impending doom. Accuracy is the last thing wanted, fear is much more useful in herding sheeple. Truth just gets in the way– Propaganda 101. Many years ago I learned about harmonic node points,that either create instabilities that can cause some cracking in the earth and heating that creates lava, or deeper down in the earth a ball of very hot lava. Now and again these very hot balls of lava escape to the surface and cause volcanoes. Volcanoes are not a crack to the middle of the world but a ball of isolated molten lava. The reasons for the harmonic nodes are cyclic and varied, but do depend a lot on earths position in relation to the other planets and the moods of the sun. TSI and sunshine are only a small amount of what comes comes from the sun, it’s mood at the moment is creating volcanoes and earth tremors in large quantities and under the ocean is really bubbling warming our oceans like a good kettle. This heating may help in the coming decades as the sun sinks in to a new minimum and our global warming- climate change becomes bugger it’s cold. When did they “become active”? When did the ice start “squeezing them”? How does this vulcanism relate to the last 150 years of CO2-induced warming? Volcanism [note spelling - we are not in Star Trek, or a Greek morality play] is a natural phenomenon, caused by the original expansion of the thermonuclear body that now appears in the daylight sky, and around which the planet we call Earth, orbits. The so-called 150 years of CO2-induced warming is an unproven hypothesis at best, and a mythical human construct for fame and fortune, at its most despicable. And before you go off on one of your childishly snide rants, please remember that correlation does not prove, or even demonstrate, causation. Climate change is, and always has been, a conjecture, and nothing more. And for those, like Craig, who miss the subtly, ice has weight, which bears downward under the force of gravity, and has the potential to squeeze magma chambers into ejecting molten rock in the form of lava, which, surprisingly, is hot enough to melt ice. OT but just listened to Hanson and Roberts at a press conference about the ABC , in return for their support for media ownership changes they have forced some concessions out of the govt . ABC will now have to be fair and balanced in their reporting was the change that Malcolm Roberts just couldnt stop beating them about . they certainly will get my vote and actually was one of their better press conferences where it would seem they were prepared for the presstitites . They seem more disciplined and getting rid of the “two-out-of-three” rule is no big deal, except for the big end of town. The Hansonites and Greens are both seeking greater diversity in the media landscape, especially in the rural and regional areas, so they have more things in common than previously thought and will allow the bill to pass. Well, I have to agree with you on that el gordo. One Nation thinks it’ll get a benefit from rural and regional voters by being seen to be looking after their interests. Overall, I have to say the balance of the benefit will go to the Greens, on the basis that persistent propaganda swamps fact every time. Hanson should have insisted on a savage cut to the ABC’s budget, the transfer of the ABC’s HQ to Gunnedah and a requirement to reduce its operation to one Channel. Ditto SBS. But you knew that didn’t you. One Nation strategy is the correct approach, as part of the package they demand Auntie gets rid of her bias. Not sure how this will be accomplished, I suspect they have a plan mapped out to remove the Trots from the news rooms. The latest is that the Phon and Greens won’t support a ‘dirty deal’ involving One Nation, so its back to budget cut strategy. (2016) Although this has been a relatively average year for the world’s active volcanoes, the activity that did take place was still spectacular. Out of an estimated 1,500 active volcanoes, 50 or so erupt every year, spewing steam, ash, toxic gases, and lava. In 2016, erupting volcanoes included Tungurahua volcano in Ecuador, Villarrica in Chile, Mount Sinabung in Indonesia, Piton de la Fournaise on Réunion Island, Kilauea on Hawaii, Pavlof Volcano in Alaska, Mount Bromo in Indonesia, Nyiragongo in the Democratic Republic of Congo, Ethiopia’s Erta Ale volcano, and more. According to The Climatism Gospel The Guardian, the significance of each depends on the timeframe being considered. A very large volcano in 2011 may significantly reduce temperatures in 2012 but slightly warm them in 2100. Tricky to get one’s head around I know, but just keep the faith. Yes…no one look at the little man behind the curtain….. Nothing to see here….move along now…..
Only 1500? You haven’t counted the submarine volcanoes, Manfred. Oregon State University thinks there is a lot more than just a mere 1500. 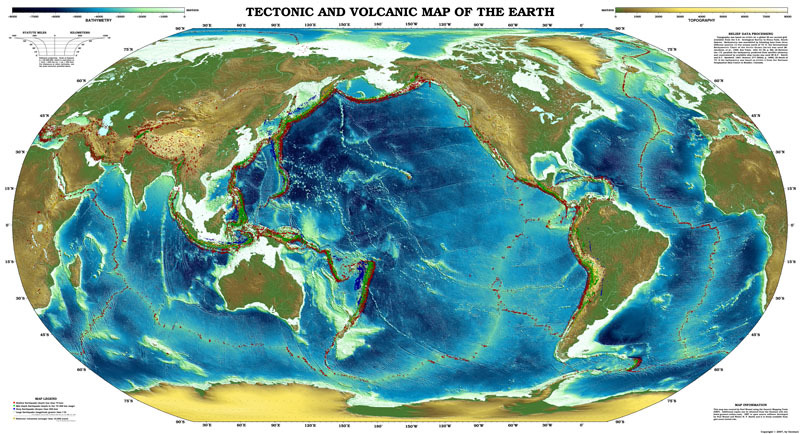 If an estimate of 4,000 volcanoes per million square kilometers on the floor of the Pacific Ocean is extrapolated for all the oceans than there are more than a million submarine (underwater) volcanoes. Perhaps as many as 75,000 of these volcanoes rise over half a mile (1 kilometer) above the ocean floor. If a mere 50 out 1500 aerial volcanoes erupt at any one time, then the sea floor could have over 33,000 active at any one time. Hm. That’s a lot of heat going into the oceans. Trenberth will be pleased. So when did all this activity start? 150 years ago? Natural History does not start when a human notices something. It starts with the birth of the planets. And you might be surprised to know, that heat is being constantly released by the surface of the planet, and in particular through the oceans, in the form of water vapour, which forms clouds, which lift the heat into the higher atmosphere where it can be emitted into space. This is middle-school stuff Craig. So you are either trying to get us to do your homework for you, or you are just playing childish games, or perhaps you are just a mindless dork. It is hard to tell. So these volcanoes are not relevant to global warming then? Why are these people going on about them as if they are somehow involved in climate change? 1/ By what mechanism does an erupting volcano affect the Earth’s energy budget in the short term? 2/ By what mechanism does an erupting volcano affect the Earth’s energy budget in the long term? This is how science is done – a hypothesis is presented, with supporting arguments, and other scientists will attempt to find a flaw in it with counter-evidence. “That’s a tricky idea, I don’t understand it, I’m sure it must be wrong, it’s the vibe, you know” is probably not the line to take if you seek credibility. Manfred was being sarcastic. It is something that grown-ups do. So, just to be clear, Manfred actually has some sensible argument to put up against the hypothesis that he was being sarcastic about? I am thinking the sarcasm is all he has. They’ve worked out that the cordillera-looking thing is a cordillera and not chopped liver or a wigwam for a goose’s bridle. That’s why they’re paid the big bucks. Were there 12 of them? Was dog food involved? There’s a button at that link on the right hand size “view PDF” that returns the entire paper. I wonder about the extent of submarine volcanic activity along the rift system that exists underneath the Arctic Ocean. Who would have thought, Active Volcanoes in both the Antarctic and the Arctic regions? So, we have a large scale field of Arctic volcanoes, that are deep below the normally accepted depth for being violently active, with clear evidence that this large scale field of Volcanoes located in the Artic oceans Gakkel Ridge area are and have been active for quite some time. Although I noticed that being the Nat Geo, dear old Co2 had to get a mention as the bad guy. However, also as noted, just not as well for some odd reason, as the obvious problem is that you have to have fairly large and serious Active Volcanoes to get Co2 in any volume to affect the local climate. Although, just like the Antarctic, the warming and by definition, the Co2, seems to be coming from below. Which then begs the question, what is the Co2 concentration at sea level and up to say, 5000 metres above at these locations? One would have thought that if these Active Volcanoes are contributing to Global Warming pardon, Global Co2 Catastrophe pardon again, Climate Change, then the localized Co2 content should be greater than average? Although the most telling part is that nobody has actually sighted any actual Global Co2 Climate concentration or density Maps, or for that matter, even localized ones, as I would imagine, presenting any such would sink the whole Co2 runaway argument pretty quickly. The Grauniad is always behind the times. It’s taken them a while to catch up with the rest of the world, and they still aren’t anywhere nearly wholly there, yet. There’s the OCO-2 web site for NASA’s CO2 monitoring satellite. Take the representations of its output with a little salt. This map is the first map published for October to November 2014. It rather shows The CAGW Narrative rather poorly with most of the CO2 emissions being from rain forest and ocean up-welling areas. Only the Chinese industrial area and Indonesia’s forest clearing (with some assistance from active volcanoes) appear as the main man-kind CO2 emissive areas. Ive nicknamed the “The Guardian” to “The Stalingrad”….not sure why ( ahem ) but seems to be a better fit…. What? Like this, you mean? 2009? Pretty lame even for you Craig. Craig is correct, most of the industrial CO2 is in the Northern Hemisphere. Could you kindly, as an exercise to all of the good readers herein, please advise how we identify naturally occurring Co2, as opposed to industrial Co2 and what chemical differences there are? Also, if you could, as a further exercise for all of the good readers herein, please advise the half and whole life of naturally occurring Co2, as opposed to industrial Co2 and whether or not the natual process of Photosynthesis would consume industrial Co2 in the same fashion as naturally occurring Co2? This would assist those who seem confused or unsure as to how we identify the two forms of Co2 and how they are treated in the nature planetary biosphere. Clearly this would also assist those who provide diagrams and references to industrial Co2 pollution and how it has contaminated the naturally occurring Co2 atmospheric content. Also, for the benefit of those that aren’t yet clued up on the process of Co2, Photosynthesis and the planetary biosphere, and also for the benefit of Craig Thomas, could you throw in a quick explanation of why Co2 is essential for all life on earth? Alternatively, some links back to some old articles in the “joannenova.com.au” site would also suffice, as from memory, these facts and figures are scattered throughout the site and date back a few years now. The other choice would be to suggest they use google of their own accord. Also, you might suggest that as a comparison to the industrial age, they could also research the living standards and life expectancy in the “dark” ages and medieval periods. You could Google all that stuff Iain, including all the bits you’ve had explained to you before – apparently unsuccessfuly. CO2 produced by the burning of fossil fuels is different from the background CO2 at an atomic level. CO2 levels in the atmosphere have been between 220ppm and 280ppm for longer than our species has existed. In the last 150 years, we have increased that to 400ppm. Last time CO2 was at 400ppm, sea levels were about 16 metres higher than they are today. If you know the answer, then a brief précis might be more helpful that just being a dork and pretending that you knew all the time, but were too important a personage to bother your precious time in answering the question. And by the way, you claim a logical fallacy, when there was none. Craig, on the other hand, at least gives a partial answer, in pointing out that the source of CO2 can be determined by the isotopic admixture. However, Craig confuses the issue by mentioning that there appears to be no cause and effect relationship between the density of CO2, and the height of the mean sea level. Just put your thinking cap on for a moment, Rereke. If geology shows us that global average temp X is correlated with Global mean sea level Y, this fact on its own tells us nothing about how long it takes for Y to occur after X has occurred. Your jump to identify a supposed non-correlation is faulty thinking. No, what I am pointing out is that you have presented no causal means for what you claim. Correlation does not imply causation. I don’t need to “suppose” a non-correlation. The onus is on you to demonstrate that any correlation that does exist, does so by means, other than chance. And I don’t need to wear a “thinking cap”. I find logic to be much more efficacious. In the history of making dumb comments on the internet, that one joins the big league. I referred to the well-known correlation between temperature and sea level. I didn’t mention causation. In the wonderful world of Rereke il-logic, apparently not mentioning something signifies that that thing doesn’t exist.. If you are suggesting that temperatures in this planet’s history and sea levels are not correlated, you are even less gnorant than was first suspected. 1/ Take a course in logical thinking. Actually pay an institution to teach you how to think logically. 2/ Read up on sea levels, ice ages, insolation, that sort of thing. Maybe do a course on geology. Mark D. seems to be another for whom logic is a foreign country. “nobody has actually sighted any actual Global Co2 Climate concentration or density Maps”. Ergo that statement is wrong. Your mention of the date is a logical fallacy known as the non sequitur. It’s the kind of mistake people make when they are a bit hard of thinking. I trust that you are actually what you claim to be and aren’t clearly misinformed or alternatively, are yet to be well informed and would look to become slightly more factually informed and skeptical? I also trust you aren’t just an alarmist activist trolling or are paid as such. However, as that may be, the fundamental problem with your graph and hence your theory’s that such research and NASA drivel is worthy of consideration, much less that it may be accurate, is explained here, in layman’s terms. As for quoting a known source of alarmist propaganda, that being NASA, one that has been seriously compromised by James Hansen, even you should be aware that NASA and James Hansen have parted company, and that NASA has been forced to back pedal on a lot of their claims, more so claims made by James Hansen, when they were challenged as to the truth and the fact of their claims. Also, you do realize that a land based observatory, that uses extrapolated mathematics, based on observations in one location, and whose RAW base data isn’t readily available, a trait of NASA and James Hansen by the way, isn’t the best reference to quote? I also trust that you do understand that seaweed, algae and kelp consumes enormous amounts of Co2 and exhausts Oxygen in return, which is the natural process of photosynthesis? Therefore, this chart you provided should reflect that fact? However, and oddly enough, in areas of high seaweed, algae and kelp locations, this chart shows little to no Co2 concentrations, which in warm water and the surrounding warm atmosphere at least, should be obvious? I trust that you are aware that Seawater is a natural Co2 sink and the Co2 concentration in seawater varies with the relative water temperature? Although you will have to hunt it out, the Scripps Institute has actually done a lot of studies on this, which unfortunately conflicted with the warmist agenda, but the end result is that the warmer the water (around or above 17-19 C) the greater the concentration of co2 and hence the greater the natural process of photosynthesis via seaweed, algae and kelp? I also trust that you do understand that salt water oceans need both Co2 and oxygen in order to maintain their biosphere? Lastly, but not least, I trust that you also understand that a planetary level of Co2 at or around 200ppm, on average, is the death threshold for all life globally, including coach roaches and all Marine life? This factoid is easily googled, as I noticed your chart currently has world wide Co2 at an average of only 150ppm above the global death knock level? Given that the two most flourishing periods for all Flora and Fauna in recorded history were the Triassic and Jurassic periods, which had an average of 2400-3000ppm and 1200-1800ppm respectively, don’t you think that it would be wise to promote a healthy planetary biosphere for all life, rather than a seriously flawed model that will kill all life on earth, forever? Just asking, but your input would be interesting, as would your understanding of high school level physics and planetary biology? 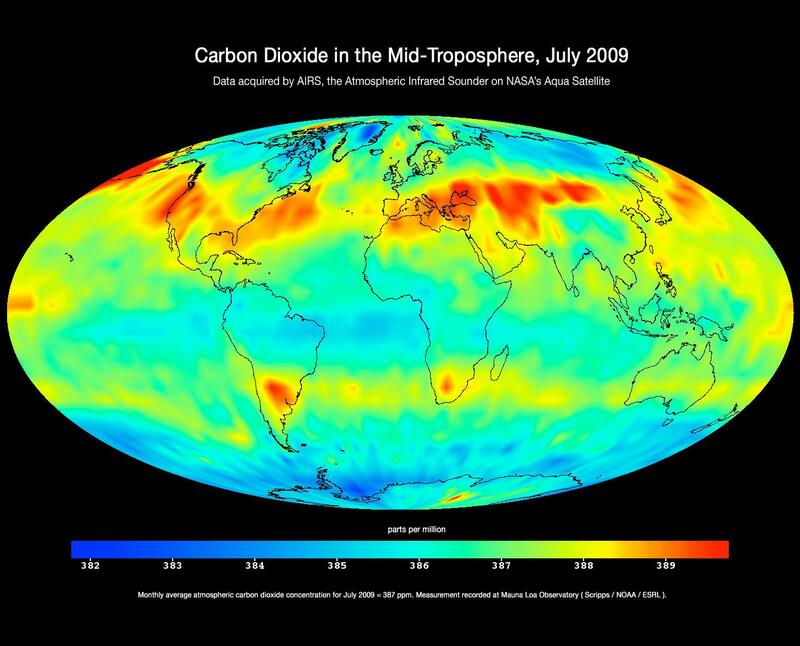 The planetary mixed gas content, that being the average planetary gas mix of Nitrogenous gas at around 77-78%, Oxygen in gas form at around 15-18% and the rest in various mixed gases, where water vapor averages around 1% of that remaining total and Co2 in gas form, in total, constitutes less than one half of one percent, doesn’t bode well for global warming/climate/alarmist physics and planetary biology theories? Thank you for your response. It was masterful. Unfortunately, your trust may be misplaced in that regard, in that Craig seems to follow the latest meme du jour supported, or perhaps guided, by Gee Aye. There is little doubt in my mind that their interests are, in some respects, more Public Relations related, rather than orientated towards determining and sharing the factual truth in science. Which then begs the question, is there enough geothermal heat to melt West Antarctica, or is CO2 involved? Are you implying these 138 volcanoes, up to 4km high, all sprang into existence in about 1998? No Craig. They were noticed during the time-frame spanning 1998. They could have been there for millennia. Who is to say they were not? Craig responds with the JPL global “depiction” of supposed industrial CO2 distibution, based on the known distribution of actual industry. That is, maps produced from modelling, rather than empirical evidence. Mark D noticed this a the time, and made a comment to that effect. Quite reasonably, and presumably with tongue in cheek, Iain NaHearadh then asked how “naturally occurring Co2″ can be distinguished from “industrial Co2″, and whether or not any difference would affect the process of Photosynthesis. And how does your mate, Gee Aye, resond to that? He says, “Look it up. It is easy to find. This is the fallacy of ‘I win the argument because someone didn’t answer the hundreds of questions I could not be bothered finding out about myself’”. Talk about scoring an own goal. “You could Google all that stuff Iain …”. Absolute priceless fail, on Craig’s part, and on the part of Gee Aye. A pair of priceless gits, is what yer average British yob would call you. But us Maori boys aren’t as rude as that. I will mention though, that Ian probably knows more about this subject than the rest of us put together. Lift your game folks, the grown ups are about to enter the room. You are right I was lazy. I should have gone and looked it up myself just because he asked, so as to pass it on and not lose the agrument because I did answer questions promptly when asked. How could I be so daft. Socrates, the Greek philosopher, would teach, by asking his students questions, and then critiquing their answers. That way they learnt to question everything, and gained knowledge by teaching themselves. Iain NaHearadh (probably a cryptonym) uses the same, or similar, techniques. These are academic tricks, therefore I assume that he is an academic, and probably a senior one, who is very much aware of the gulf that often exists, between the reality of Physics, and the pragmatics of Politics. If I am correct, he wanted, and perhaps still wants, us to figure out how the gulf between physics and politics can be reconciled. And thinking about that, is kind of important, because we seem to be wasting a lot of time, resources, and opportunities, in arguing about stuff that really comes down to unimportant point-scoring. out of interest- do you know who this “John Morrison” is? With his eloquent use of “alarmist” and his solid proof of corruption in trusted organizations and his first rate understanding of biological and geochemical processes? I know several John Morrison’s, it is a very common English name, meaning John, the son of Morris. English is useful (sic.) like that. But, no, I don’t think I know the specific one you mentioned – sorry it has been a long day. They only discovered a couple of years ago that the geothermal heat flux in West Antarctica is far greater than they imagined. The Klimatariat must recant catastrophism, so that we can all get on with our lives. Aha! So, the missing heat is not hiding in the deep oceans after all, but under the Antarctic ice! One day they’ll happily retired and sitting in the sun on the back deck with a lap blanket over their legs, they’ll look back over their life and wonder if they could have gotten some of it wrong? Naaaa! … right: gotta keep The Grants rolling in. Are you another confused about the difference between when these volcanoes were observed and when these volcanoes were born? You might be confused Craig, but I don’t think many others are. Act one: Climate Scientists loudly proclaim that the ice sheets of West Antarctica are melting due to climate change. Act two: Geologists discover that there is empirical evidence, of volcanic activity, sufficient to account for the observed melting of the West Antarctic ice sheets, thus establishing a demonstrable cause and effect relationship. Act three: Climate Scientists now have to find a way to recant their previous alarm-ism, and find some way to gracefully leave the field, without setting a precedent that can be thrown in their faces, when they next make proclamations, without any supporting evidence (other than correlation). That is the state of play … as they say. A very poor work of fiction. Here in the real world, “Act two” does not exist outside your fevered imagination. The volcanoes are up to 4km high – they did not just start melting any ice in the last 150 years. You might also benefit from actually doing some research into what ice has been lost from West Antarctica – as far as I know, notable ice loss is concentrated in the area of ice *shelves*, not sheets. Ah, but “Act Two” very much exists, as evidenced in the archives of this site. Please provide proof that it does not. Too bad one isn’t under Canberra. The emmissions are mostly just hot air but it is still an extremely destructive seething puerile mass of political incantations that emanate from numerous political fissure filled fountains of infantile level prognostications. Hot air plus huge quantities of H2S. More like the old hags around the cauldron in “Macbeth”…. Sydney could be warmer tonight than Melbourne was today. The rivalry between Australia’s two most populated cities often results in gibes about the weather – and tonight will certainly give Sydneysiders something to gloat about. Today was one of the warmest days so far this winter in Melbourne. The city had climbed two degrees above average to a top of 17.4 degrees by 5:00pm. Not to be outdone by the Victorian capital, Sydney will attempt to outdo Melbourne’s daytime maximum temperature tonight. But I doubt it would have been suitably homogenised and adjusted if it was before 1910 and therefore might be just the real actual measured temperature on that day. A measured temperature that has to be taken with a large grain of salt as that 19.7 C in 1885 will not have had been suitably adjusted through three or four algorithm driven temperature massaging programs to conform and fit in with the output of the current run of climate models that are being used to analyse the 19th century temperatures. You can’t count anything more than 30 years ago you mean . Don’t trust anybody over thirty. What’s interesting is that the 1885 night is likely to have been clear, since August that year was full drought in Sydney (zero rainfall on the Botanic Gardens), a drought which continued through spring, probably the worst spring in the city’s history, though 1888 was the driest year in total. Unless some haze drifted in it’s hard to see how such a high temp could have been sustained through the night at that time of year. 19.7 minimum is certainly more typical of high summer. But who knows? August is very uneven in Sydney and late winter heatwaves blown in on light westerlies are not unknown. Of course, if 19.8C were to be reached on August 31 this year, we know from bitter experience of our appalling luvvie media – Murdoch’s news.com.au being at least as bad as the ABC and Guardian in this regard – that judgement and common sense would not be applied and that it would be occasion for yet another shamelessly manipulative Warmageddon story. Unprecedented August temperature! Gotcha at last, 1885! Hang on you lot, I have the memory of an elephant and I distinctly remember an article on this wonderful site of Jo’s about the effect of volcanism on the periphery of the antarctic ice extent both summer and winter. Nobody seemed to be that keen on attribution which I suppose is fair enough given we don’t do fairy science but I now wonder is this an area we should apply more study? We do study it, well OK we don’t actually study it in the true sense of the word. By that I mean we don’t actually measure how much there was, how much ice there is now and then try a figure out the diff if any. When I say study I mean we use grace as a proxy to calculate mass ice loss and then create a model with the co2 is a pollutant factored in. They only research evidence that can lead to its worse than we thought statements. Vulcanism is not the kind of evidence this allow such an outcome and therefore will not be researched wrt climate science. I am quite confident vulcanologists would like to research such things but sadly they find it hard to link vulcanism with warming since the IPCC blamed aerosols for several inconvenient cooling periods. And in the IPCC AR4 WG1 document, I can see many mentions of volcanoes, including in Chapters 2, 6 and 8. Does Crakar ever get sick of being wrong? Once a dickwit, always a dickwit. Speaking from experience? Thanks for your insights. I think that “toorightmate” was referring to you, based on the nesting level. I know nothing about dickwits, so I will defer to your expertise. Wise choice. Understanding nesting levels is important in understanding the ebb and flow of the conversation. The gas that does have a noticeable climate impact is sulfur dioxide (SO2). Unlike greenhouse gases, SO2 cools the atmosphere. Magma contains a small amount of SO2, typically less than 10% by volume. Large eruptions thrust the SO2 into the upper atmosphere (the stratosphere) where it is transported around the planet. Contact with abundant water changes the SO2 gas into sulfuric acid (H2SO4) droplets called aerosols. Even though they are microscopic, there are billions of such aerosols following a big eruption, so that they actually affect the climate. Each aerosol absorbs some of the radiation from the Sun, and thus heats itself and the surrounding stratosphere. But each ray of Sunlight that hits an aerosol does not strike the Earth, robbing the surface of that small amount of heat. During the 1900s there were three large eruptions that caused the entire planet to cool down by as much as 1°C. Volcanic coolings persist for only 2 to 3 years because the aerosols ultimately fall out of the stratosphere and enter the lower atmosphere where rain and wind quickly disperse them. Er, so, in support of your assertion, “Vulcanism… therefore will not be researched wrt climate science”, you now cut and paste evidence of climate research into vulcanism? Like…thanks for the LoL, that’s a good one. Is this a case of Crakar’s left hand having no idea what his right hanbd is doing? Maybe, but you shouldn’t be so hard on yourself. You were doing your best. Mr Thomas I’ll hold back criticism of the link you presented, except that they didn’t mention subglacial volcanoes, or did I miss something? The missing link in the ring of fire. Let me get this straight – you want to castigate the IPCC for not mentioning in a 2007 document, information that became available in 2017? And, on a slightly different tangent – what climate-related conclusions are people drawing from the fact that there are volcanoes on the Antarctic continent? Have they all suddenly become active? Are they going to cool the planet or warm it? Have they suddenly started melting ice, while in the previous 10,000 years they’ve been allowing ice to accumulate? The IPCC is pure ‘Cli-Sci’. James, I will try to help you understand why this has sailed entirely over your head. AR4 mentions volcanoes in a number of chapters. They are dealt with in depth by climate science. They are one of the few (only) non-predictable impactors on climate that are actually incorporated into climate modelling. This has nothing to with whether the IPCC is “cli-Sci”, and everything to do with the fact that Crakar made a false assertion which is clearly demonstrated to be wrong by referring to almost any broad summary of the climate research that is occurring, my example being IPCC’s AR4. Ooo, so everything else is (mostly) highly predictable in the climate, is it? Well whodafort? When and where, and with what magnitude, will the next season of hurricanes and cyclones occur, Craig, if they are in the majority of predictable impactors on climate conditions? The insurance and reinsurance industries will just love you, and shower you with money, if you can reliably predict climatic conditions into the future. But wait, isn’t reliably predicting climatic conditions into the future the job of the climate scientists? So, why aren’t the insurance industry showering them with money? What does the insurance industry know, that you don’t, Craig? Non-predictable impactors on climate are volcanic eruptions, asteroid strikes and that sort of thing. Atmospheric composition, ocean circulation and orbital variation are predictable impactors. The phrase “highly predictable” is your strawman – a tiresome and childish attempt on your part to drag the conversation down to pre-school level. It was you who made the statement, that volcanoes are one of the few non predictable impactors on climate, saying by implication that the majority of everything else in climate was (mostly) predictable. Do try to keep up. I just extrapolated the implications of what you wrote, to the rest of the natural sciences, to see if your statement made any sense. The fact that you had to claim that I raised the strawman (when in effect you did – I was quoting you), shows that you are more interested in winning the argument than actually dealing with the subject matter. That makes you a troll, and I call you out as such. You are not here to discuss the science, and the implications of the science. You are here, paid or otherwise, to promote a political agenda that has nothing to do with science, except perhaps to degrade the scientific method to the point where rational thought is replaced by cutesy sound-bites. On the latter, I will fight you tooth and nail. And you will loose. Nope, that is not what I said. Read it again. The difference between “predictable” and “non-predictable” in this context – as anybody who has bothered to inform themselves would know – is the difference between, to use an example, Milankovich Cycles and an asteroid strike. … They are one of the few (only) non-predictable impactors on climate that are actually incorporated into climate modelling. Not my quotation of those same words, that followed your quotation, on the above timestamp. Weirdly, within the virtual world of the UN-IPCC and general academic consensus volcanoes are very much not taken into consideration. They are given a cursory glance, not much more. In ‘climate science™’ anything not directly to do with the distortion imposed by the CO2 nonsense is always deemphasize and devalued. The UN-IPCC and the majority of academic consensus on climate has the temerity to waste most of its time pushing out ‘fake news’, pseudo-science stories, whilst propagandizing messages of extreme climate effects. All this apparently done for the ludicrous idea that rising atmospheric CO2 level cause global warming. A stance without any proof. As Jo has just highlighted here new volcanoes (and many other natural processes) affect the climate naturally, and these new finding fly in face of the consensus and it’s ‘settled science’, its ‘we know everything’ attitude. The UN-IPCC documents just shows massive over-reach in assessing their knowledge and capabilities (the model are largely failures) whilst professing great confidence in their erroneous finding — AKA a massive disconnect from reality. Storms, hurricanes, cyclones, tornadoes, are not getting worse or more common, costs from storms are not increasing in real terms, sea-levels are not not rising at an accelerating rate — they may even be declining, droughts and floods are neither any more frequent nor any worse, seasonal variations across the globe are not outside the normals as seen in the last 1,000 years. Climate alarmism is all these people have to offer and it is a counterfeit notion of reality. How does this new information about what lies under Antarctic ice “fly in the face of the consensus”? How do discoveries about volcanoes “fly in the face” of the settled science behind the atmospheric greenhouse effect? Do these volcanoes somehow prove that CO2′s absorption spectrum is wrong? Volcanoes are mentioned all over the climate literature, because climate scientists know very well that they can have a massive effect – climate scientists are *very* interested in the fact that a decent eruption can cause *years* of failed crops and deadly winters, and they mention it all the time when looking at questions of radiative balance, modelling, and future projections. Twomomason should do more reading and less posting of the kind of arrant nonsense he has shared with us above. Please, Craig; do try to stay up to date. AR4 was obsoleted by AR5, which has been available for years now. Then you might be on the same song-sheet as the rest of us. How does AR5 “obsolete” the fact that AR4 demonstrates that volcanoes are taken into consideration by climate researchers? Are you even with us, Sophocles? If they are no longer referenced in AR5, even with just a footnote, then they are obviously considered redundant, because they were removed. Each AR succeeds, “and builds upon”. the previous ones. Nobody (apart from you) suggests that you need to go back and read each AR, in sequence, in order to access all of the information required, in order to arrive at a conclusion that they are all rubbish, wrapped in UN-spek. That gibberish is…not even wrong. Bradley’s statement was “Vulcanism ..will not be researched wrt climate science”. As I demonstrated, it is highlighted in many places in AR4, therefore Bradley’s assertion was not signal, but just more of the usual sort of noise we expect from him. Now Rereke has come along with some bizarre conspiracy theory about references to Vulcanism having been removed from AR5. Completely. Bizarre. AR5 discusses Volcanoes in the context of radiative forcing in ch8, they even included some pictures. The AR5 Summary for Policy Makers goes on about volcanoes at length on pages 12, 13, 18 and 27. In other words, your last post was more noise, and no signal. Now Rereke has come along with some bizarre theory about references to Vulcanism having been removed from AR5. Completely. Bizarre. You might have noticed that I prefixed my statement with the word “If”. Therefore it was a conjecture on my part. You turn that into, “some bizarre theory about references to Vulcanism having been removed from AR5″, methinks thou doth protest to much. You are very keen to put words into other peoples mouths, that they themselves have not uttered. Using volcanoes as a facile explain-away is not helping. For example, if any recent eruption was going to affect world climate it would be Laki/Grimvotn series, even more than bigger bangs like Krakatoa and Tambora. Only the 934 AD eruption in Iceland was dirtier. And climate was indeed affected, all in bad ways, and over a big swathe of the globe. There was indeed global cooling or something of the sort, as welll as toxicity, dimming etc. The Haze Famine in Iceland was only the centre of an agricultural crisis which involved much of the northern hemisphere. But roll forward a mere seven + years, to the monsoon failures, heat and famine of the early 1790s (notorious even in the new Sydney settlement). The Doji Bara Famine of South Asia killed too many millions to be counted. Not many dispute that this was due to the whopper El Nino of those years. Now, there was also the Chalisa Famine a decade before, some of it coinciding with Laki, but associated with climatic conditions beginning before Laki. It would be interesting to know if such seemingly disconnected events as Laki/Grimvotn and those whopper El Ninos had special ways of interplaying or at least coinciding. But who could you trust to tell a straight story if something interesting became known? Certainly not the dogma-drenched temple priests and corrupt public criers who presently pass for climate scientists and science communicators. You realise they actually counted 97 but didn’t think anyone would believe them so they reduced the figure to a much more believable figure of 91 . I had not thought about it before. However I think this is what Ian Plimer had in mind when he named his book; Heaven and Earth! ’twas your post, Peter, that triggered my response. So-crates? Is that an appeal to authority? Where oh! Where! is “Tim Hot Rock Flannery” when you want him? All those Antarctic hot rocks, really hot rocks this time, that could be drilled and exploited to cut global warming and fossil fuel use and climate change and save the planet all over again!. All that immense acreage of a vast expanse of coldness that needs a good dose of geo-engineering from our highly skilled expert at disposing of investors hard earned, our Hot Rock drilling investor and expert, Timothy Flannery . Just imagine how our big time Hot Rock drilling investor Timothy Flannery could swing and sway the investors to invest in a real genuine guaranteed geoengineering outcome with all those hot rocks under all that ice, an all singing , all dancing, planet saving, guaranteed never to fail investment with all those hot rocks used to open up vast areas of Antarctica to investment and even settlement, a truly brilliant scheme on a par with Tim’s outback South Australian hot rocks episode. An investment that would truly be world leading piece of technology if adopted and financed by Jay Weatherill and his South Austalian government as the South Australian government seeks to do in all energy related matters. Aided of course by that inveterate investor of lots and lots of South Australian’s OPM, say a few hundred billions of South Australian government investment funds, the Antarctic New Land acreage would be eminently suited as a quiet retirement location, perhaps the only suitable retirement location for Jay “windmill” Weatherill and his treasurer Tom Kickabiglossdowntheroadagain when the voters have had their say on who runs South Australia and who should be held responsible for South Australia being the global poster child on how not to run an Australian State any time, any where and any how! No wonder the Chunnel took so long to build – they ran it under Antartica. They evidently needed a heat sink for all those SUVs. Why is it these things always seem to be discovered in places where 99.9999% of mankind can’t get access to verify, but only by those that are making $$$$ selling it can? Remember the CFC’ created OZONE Hole back in the early 90′s. It was originally was near Easter Island, 1000′s of miles from land. Then it moved to the South Pole, and then the North Pole etc… If you look at the list of the biggest CFC Users worldwide, the USA is the 32nd with China #1, and many Middle Eastern Countries filling in ahead of the USA. So why are the Environmentalist whining here in the USA and not in those countries? the countries that are claimed to be causing 20++X’s greater Environmental abuse than the USA? Could it be there is $$$$$ it for some selling carbon trading, or selling alternative solutions like Solar Power, that can only be found here in the USA? BTW: Ever look into the environmental impact of Solar Power Batteries and panels and their disposal? Huh? So this is a secret conspiracy to make the world think there are heaps of volcanoes under the Antarctic ice? Why? The odd thing is why the Guardian ran with the story by Robin McKie, the science and technology editor for the Observer. Its a momentous occasion comrade, we are saved, sea level won’t rise, so you might wonder why the MSM is not saying anything? I just noticed your comment. You aren’t serious, are you? You have to hand it to the inventiveness of mankind and how often sheer serendipity has played a major part in mankind’s survival and indeed played a major part in the very survival of the planet itself. .
We invented and produced the immense tonnages of Chlorofluorocarbons, the atmospheric destroying CFC’s, the ones that were supposed to have created the Antarctic Ozone Hole and which were banned in 1998. CFC’s arrived just in time to make sure that if those 91 volcanoes, 97 volcanoes actually if Robert Rosicka at #18 is right, they reduced it to 91 to make it more believable, went off. The volcanic emmissions from such a series of massive Antarctic volcanic eruptions would just puff right on up through that Ozone Hole and head right out into space thereby saving the planet from yet another very dangerous global warming episode through those volcanic gases possibly being trapped in the global atmosphere if there was no Ozone Hole there to let them escape into space. And completely serependitiously again, CFC’s were banned except in India, China, Iran, Russia or parts of, so as to limit the size of the Ozone Hole so the rest of our atmosphere would not escape out of the Ozone Hole along with all those Antarctic volcano emissions. Now do I get to share a Nobel for that science based explanation for the existence of the Ozone Hole? So ozone depletion in Antarctica is naturally occurring because of subglacial volcanic activity. The Montreal Protocol made some people very rich at the expense of others. Actually nice point…could also account for why the ( ahem ) hole in the ozone layer is larger over antarctica. Hmmm…this little discovery could actually slam dunk a lot of global warming “holy writ” in one go…. The Klimatariat could plead ignorance, they are renown for it. So, I’ve had all these “scientists” telling me “the science is settled”, and bugger me, if they don’t go and discover another 91 volcanoes! Who knew? Their next Nobel Prize discovery will be that hot rocks melt ice. Never fear, they will also say that CO2 made the rocks hot because they can’t think of anything else that could do it. The gravy train will keep chugging along. Any other method of verification is too unpleasant and is much deprecated these days — mostly because it requires the expense and hazard of people and equipment going out and making observing, but mostly because it needs such a lot of logical and rational appreciation of the observations. Of course it will be a model! The models have been proven to work, over and over again. In fact, we get yet more proof, every time they are run. Reality is constantly changing, so we cannot rely on it. It is just not trust worthy. In a rare event in Australia’s ultra-partisan parliament, the government failed to vote down its own bill on Tuesday evening, after the opposition Labor party attached the amendment. The government has 76 members, a majority of one in the 150-seat lower house. But several government members failed to attend the vote, which the government lost 69 to 61. Adani is fighting the Queensland Environment Department, rather than pay a $12,000 fine for polluting the Great Barrier Reef – a breach the mining giant reported itself. Which aligns with The Great Ring of Fire. forget the headline. it’s really about forest restoration. The project – dubbed Billion Tree Tsunami – aims to slow down the effects of global warming in Pakistan which ranks in the Top 10 in a list of countries most likely to be affected by the phenomenon. The International Union for Conservation of Nature set up the Bonn Challenge in 2011 and more than 20 countries have so far signed up to the commitment. The organisation congratulated Mr Khan on reaching a “momentous milestone”. Terming the Pakistan Tehreek-e-Insaf (PTI) claims of planting 800 million saplings in Khyber-Pakhtunkhwa “a figure too exaggerated”, the environmentalists and foresters have also questioned the capacity of the World Wildlife Fund Pakistan to accurately assess the programme. Hence, the entire project is mired in irregularities and controversies, triggering concerns over environmental issues coupled with virtual hijacking of the project by influential figures, led by bureaucracy. Plantation of eucalyptus much beyond its fixed limit has also raised alarm bells. Earlier, it was planned that the number of eucalyptus will not exceed 10-20 per cent of the plantation but due to unavailability of Pine and Acacia, it was decided to increase the number of eucalyptus to about 48.5 per cent, the official said. Even the project director was so disappointed from the malpractices in the project that he decided to quit but he was brought back, the official claimed. If some day the NAB intervenes the BTT will become a massive corruption scandal of the present government, he said. The official said that he had confirmed reports that 48.5 per cent of the saplings planted were eucalyptus. When asked that why they did not protest the decision of planting eucalyptus, he said that during the first meeting of the technical committee held in April 2016, in KP House Islamabad the environment experts had expressed their concerns over massive plantation of eucalyptus. The KP government was so upset over the criticism that since August 2017 it has not convened the technical committee meeting, the forest department official said. The official said that he was also astonished about the WWF’s “silence” over the plantation of such a huge number eucalyptus. More trees cant hurt…..after all, anything is better than using treated pine…awful useless stuff IMHO…give me ironabark and decent hardwood any day….. They may even develop a decent forest industry too….why not? One of America’s fastest-growing loan types was designed to help homeowners make eco-friendly upgrades. But a Wall Street Journal analysis of tax data in 40 counties in California—by far the biggest market for PACE loans—shows that defaults have jumped over the last year. Roughly 1,100 borrowers have missed two consecutive payments this year through the tax year that ended June 30, compared with 245 over the previous year. That means they are in default, and could potentially have their homes auctioned off by local governments within five years. The average PACE loan is about $25,000. But unpaid balances get bigger quickly; they accrue additional interest at the rate of 18% annually. Under California law, homes can be auctioned off in a tax sale in up to five years if the homeowners don’t pay the balance. “For us to be the heavy hand and make [borrowers] go through the tax sale process is onerous on us,” says Jon Christensen, the tax collector in Riverside County, where 227 PACE borrowers are in default. Wall Street is hungry for bonds made from PACE loans. In July, asset managers and pension funds piled into a $205 million deal from the largest PACE lender, Renovate America. It was the company’s 11th securitization since its 2008 founding. Investors are attracted to the bonds’ relatively high yield of about 4% and the loans’ priority structure. If a borrower defaults, PACE lenders are paid back before mortgage lenders. The deals have received high marks from rating agencies, which have said the program is too new to predict future defaults. Still, some investors are getting nervous. The data, which only offer a limited view of overall PACE loan performance, show that the average default rate has climbed to 1.6% from 0.9% last year. The default rate is lower than the average credit card default rate of roughly 3.5%, and higher than the first mortgage default rate of .6%, according to the S&P Dow Jones Indices. But the PACE default rate doesn’t capture borrowers whose missed payments are covered by mortgage escrow accounts, which appears to be a common occurrence, according to borrowers, banks, real estate agents and attorneys. Last year, California tax collectors reported that roughly 1.1% of homeowners missed property-tax payments, according to the tax collectors association. Gosh, next thing you know someone will discover that Mr Erebus, erupting continuously for decades of not centuries, has been spewing chlorine into the very spot where ecological nationalsocialists imagined the Bozone Hole had been conjured into existence by a dire shortage of economic coercion! And this is odd because, you see, there’s hardly any humanity–south of the Equator, that is. For a long time I’ve tried to make the point that if floating ice is melting then the suspect should be the water under it rather than the air above it. I didn’t know about these volcanoes until now but they sure do make it look like I might be right. Of course, being right isn’t permitted from the climate change denier side of the debate, is it? So I guess I’ll have to stand in the corner all day; or maybe write, “There are no volcanoes under Antarctica,” on the blackboard a thousand times. The drawing on the right with Antarctica in white and maroon dots shows known surface volcanoes. The new ones are all under a couple km of ice in the West Antarctica Rift System. No matter how much melting is caused by volcanoes, it only adds to the effects of global warming. So, since we know climate change is “happening,” we are recklessly compounding the volcanic liquefaction of the West Antarctic ice sheet by motoring and flatulence. I would call that a stunning exercise not in post hoc propter hoc but in how ignorance can be cured while stupidity is forever. It has to be said. Antarctica is far too cold for Volcanoes. 97% of scientists who think this is right agree with it. The other 3% are just confused. A volcano heat and emissions tax is needed. “the North Pole was still surrounded by nearly 800 miles of solid pack ice as of last week.” Clearly just a minor problem for sailors. A friend was in Svalbad a three weeks ago. The ice sheet started on the Northern side. They were 1000km from the North Pole. Obviously these boats operate on the time honoured sailing principle of leg pulling. Great picture. You can just see Svalbad above the top of Greenland, coloured blue. You can walk from there to the North Pole, potentially. Take a rifle. Sailing, no. And you thought geoscience was settled. The scariest thing about this article is that it wont even register a raised eyebrow by most of the Guardian Readership. “Climate Change is real. Human’s are causing it and any other warming by nature is just on top of it.” The Guardian could even run a report on the two major and only heat sources in nature, the Sun and the molten ball of lava beneath our feet and the Guardian readership would be like, “Oh my Gaia! Now we got the Sun and the Earth on top of Co2 warming!”. Time for a Lava Tax. Anyone who can say “lava” must be taxed. Given our lack of knowledge about the lands beneath the ice caps it is hardly surprizing that we are now seeing changes because volcanic activity is on the rise and heat transfer from warm rock to ice would be obliged to remain local. (In air the heat rapidly disperses). Over at SOTT there is an aerial picture of what could be water vapour or even steam condensing as it rises out of a crevasse in a glacier in the Kulusuk region of eastern Greenland where the ice is over 1000m deep. Without data we have little idea about what is going on under the Antarctic ice so people with a political or editorial axe to grind tend to borrow it for their own purposes. update re comment #26 on Great Barrier Reef Marine Park Amendment Bill 2017. Labor has pounced on an opportunity to embarrass the Turnbull government after it lost a vote on the floor of parliament. A number of ministers, including Peter Dutton, Barnaby Joyce, Julie Bishop and Michael Keenan, missed a vote in the lower house on Labor amendments to uncontroversial changes to the Great Barrier Reef Marine Park Act. The amendments, which condemned the government over climate change, got up 69-61. ***But Leader of the House Christopher Pyne asked the vote be retaken, claiming the bells for the division should have rung for four minutes instead of one. It was subsequently defeated 74-69. Labor gained another edge soon afterwards by defeating the government by 69 to 61 votes on an amendment to a bill to protect the Great Barrier Reef Marine Park, a rare victory for any opposition on the floor of the House of Representatives. The government lost the vote when Mr Turnbull, Ms Bishop, Mr Joyce, Tony Abbott, Darren Chester, Peter Dutton, Warren Entsch, Jason Falinski, Paul Fletcher, Greg Hunt, Michael Keenan, Dan Tehan and Ken Wyatt did not get in the chamber quickly enough for the vote. Liberals blamed the embarrassing defeat on the fact the bells had run for only one minute instead of the usual four minutes. The Speaker, Tony Smith, acknowledged the problem. ClimateChangeNews hasn’t corrected its story. at no point does ***”Fair. Balance. Impartial.” ABC mention the Amendment lost in the second vote. ABC has no other article on this topic. Then to wrap it all up, One Nation decided they wanted to get back in the limelight – announcing their support for the Coalition’s media ownership shakeup in exchange for more scrutiny of the ABC and demands for fairness and balance. Massive thanks to Jed Cooper for his work with the camera again today. For now though, thanks for your company. That’s how one Labor MP has described that vote in the House of Representatives. It actually sums up most of the day, really. TWEET: Mark Butler: Parliament just passed amendment 69-61 saying Govt failing to protect GBR & failing on climate change! The amendment bill the Government lost in the House of Representatives a few moments ago condemned the Government for failing to protect the Great Barrier Reef. Speaker Tony Smith is going to make a point here. The Speaker says they only allowed one minute for the MPs to get into the House. Rather than the usual four. It’s not a contentious piece of legislation. But it’s not a good look for the government. theirABC’s Jane Norman’s tweet above is still her most recent tweet. no update. guess she got tired. It’s time to shuffle off so let me tell you what happened in reverse order. The Coalition lost a vote in which Labor briefly amended a government bill on the Great Barrier Reef. The amendment said the government was failing to protect the reef and failing to act on climate change. According to reports from the chamber, those that missed the vote included the Julie Bishop, Barnaby Joyce, Tony Abbott, Paul Fletcher and Michael Keenan (who missed a previous vote). 15 Aug: Spectator: Charles Pier: Do they just want it all to be over? Late this afternoon, the Turnbull government lost a vote on the floor of the House of Representatives, 61 to 69. But let’s just jump back a par. Not… enough… of… the… Coalition’s… own… members… could… be… bothered… turning… up. The government of the day is only the government because they have the numbers in the House. They only remain in government by keeping those numbers. One thing is incessantly drummed into Reps backbenchers by the whips: when the bells ring, it’s their job to get into the chamber — pronto. Ministers, too. After all, this is the government that lost a vote to bring on a debate into a banking royal commission in the first sitting days after last July’s debacle. They wouldn’t make that mistake again, would they? So, should we swallow Pyne’s excuse? Or was this a sign that even if the ever-ebullient Member for Sturt refuses to read the writing on the wall, enough of his colleague have: that they know that one day sooner or later even streaking down the corridors to the chamber at a pace that would rival Usain Bolt’s personal best won’t save the Turnbull government — and that they might just be better off letting it happen sooner rather than later? I will ask a question for our many and varied but almost universally switched on commenters and posters here on Jo’s blog. And the question; Are we at a tipping point? Not the “tipping point” you have all been mentally conditioned to believe is a fundamental ideologically based belief of the climate alarmists. Rather a “tipping point” that is now beginning ito roil into doubt and increasingly into a disbelief allied with an increasing level of sarcasm and plain contempt for a lot of supposed and puported and promoted as such, “Science”. All beginning to replace what was an almost mythical and total trust by the public in the impartiality and the truthfulness and honesty and integrity of scientists and science. Certainly skeptics are leading the way in their doubts and now seen more so recently, plain contempt for what is passed of as science today. Purported “Science” that is often little more than a hodge podge of ideologically based allied with personal beliefs dressed up in a whole series of maybe’s, will’s, could’s and etc all passed off as some sort of unchallengeable science because of the arrogant, grandiose, self promoting , “how dare you question or doubt me. I’m a scientist”. practiced by so many of those who grant themselves the honorific of “scientists”. But like water dripping on a stone, there appears to be no effect whatsoever on that stone. But come back a couple of decades later and that steady drip, drip of water has eroded and made a noticeable depression in that stone. So it is with the skeptiscm that is now not only being directed at the climate alarmist industry and ideology but is now beginning to cross over into a growing sceptiscm about many other so called scientific set in stone for eternity findings around other phenomena that scientists have cast their hard line, “we will not allow anybody to challenge or doubt us” so called scientific research and studies. We are seeing what looks like becoming an avalanche of studies about science itself and the ways in which it is or is not being conducted across every scientific endeavour. It is now almost universally being shown just how much of scientific conduct and purported scientific studies are deeply flawed to the point of a very considerable level of plain straight out incompetence and just plain straight out deliberate fr–d in a remarkably high percentage of the limited number of scientific papers actually looked at so far for evidence of such unacceptable practices. Ok! Now I am as much at fault here as any one with the level of sarcasm being displayed in comments above pertaining to Jo’s headline post on the finding of even more Antarctic volcanoes. But the truth is that all of the scientific output on Antarctica that reaches the public is given as being absolutely unchallengeable according to the “scientists” [ what demonstrated level of integrity, adherence to scientific principles, honesty and a profound humbleness that maybe your findings might be wrong but you have done your honest best is needed before you deserve the genuine honorific of being called a "Scientist" in the true meaning of the word ? ] who put themselves forward to the sycophantic media on an often as possible basis and who take upon themselves the role of the final arbiter of the real truth of a Antarctic ice and glacier catastrophe in the making that will have, according to so many of these purported scientists, catastrophic consequences of unbounded severity for the planet. And those Antarctic claims are only one of dozens of such claims by that same cabal of grandiose self promoting, self serving supposed scientific experts who take upon themselves, usually with no meaningful qualifications on the subject at all, to promote their own personal alarmist ideology using the respected honorific of “scientists” to give themselves undeserved credibility. They are allowed to get away with this due to a baseless sycophantic and utterly ignorant scientificly illiterate media who help those same purported “scientists” to promote themselves and their non science based ideological beliefs due mostly because the message of these scientific self promoters ties in with the left ist leaning media agenda’s. Those claims made by those purported scientists in the media outlets are when closely examined, usually little more than a self promotion of the worst kind. So we see as above in the comments an increasing level of just plain straight out sarcasm and even a level of contempt being offered up as a response to the claims and stupidities of some of the scientific proffession who have deliberately mislead, deliberately mushroomed the public, self promoted endlessly and served up scientific pap to the media as some sort of scientific truth only to be caught out completely when new far more factual and better researched science destroys their claims and much of their credibility. We are beginning to see this small but increasing level of contempt for much of the so called science being generated today, creeping into the far more proffessional and integrity based sectors of science. Nobody yet knows the end of this or if science will begin a long slow descent in its reputational qualities in the public’s eyes or will begin a very harsh house cleaning leading to science again regaining the respect that it enjoyed through the early to latter half of the 20th century. I think as far as public’s regard for the reputation, honesty and integrity of “science” today and its practioners are beginning to be seen by the more scientifically orientated sectors of the public, “Science” in specifics but science overall more generally may well be close to a tipping point where its reputation and standing in our society will be seriously demoted and its importance will be discounted and therfore its impact and access to the power centres and the support it now revels in both financially and in its believability will no longer count for a great deal in the power structures and in the eyes of the public of our society. No, science is not discredited. What is discredited are faux scientists and science by consensus and opportunists who see climate change as the gigantic trough of cash that it is. The number of people involved and earning a living from Climate Change dwarfs every scientific endeavor in history and most of it is not even related science. For all the money, nothing comes out. How outrageous is it that the CSIRO had 350 full time Climate Change scientists. Doing what? You even have serious particle physicist and astronomer Brian Cox offering that NASA could not be wrong on Climate because they put a man on the moon? Dead marsupial specialist Tim Flannery offering his opinion on nuclear power and other technologies. Failed physics PhD Michael Mann and his tree ring hockey stick and IPCC head train engineer Pachauri who flew 360,000 km a year arguing against flying. Then absolutely science ignorant writer and Nobel Peace Prize winner Al Gore. All claiming that they are scientists who alone know ‘the science’. The common element is that it pays their wages. We have had carpetbaggers before and this Climate lot fly in their tens of thousands to Lima and Paris and Cape Town and Doha and Rio to catch their limousines to their luxury hotels protest against flying and limousines and luxury hotels. Hypocrites have always been there though history, rich fakirs. It is hard to believe that the Beatles’ rags to riches Maharishi Yogi left at least a Billion fortune. No science is fine. Most real scientists are just getting on with their jobs and staying out of Climate Change. It is a pretend science. The Head of that “Science” fish , the science associations, the university science departments, the funding bodies usually peopled by those with some science training, all of them today have failed almost completely in holding and maintaining a strictly secular and neutral based position on a whole range of quite controversial and unproven assumptions in science, most prominently in climate science. Consequently these same science promoting and the ultimate holders of the long established cultural approach to science which in past times would have encompassed a culture of integrity, honesty, a full blown and probably open condemnation of attempts to mislead and corrupt science through the publication of unproven and fr–dulently based science, have frittered away their reputations and that of the science they purport to represent by adopting and vigorously promoting positions and causes for which they have no proven science of undoubted integrity to support their positions. The various scienctific representative bodies and organisation, the universitiy science departments , the science funding bodies, all have adopted and have promoted some very controversial and for the most part completely unproven by acceptable scientific processes, positions on a wide range of the unproven and sometimes improbable claims made by some sections of and groups of scientists as being the true facts based on science. Science in this case that is frequently based entirely on unverified , unvalidated models which in turn are based on the outputs of groups of other similar in the universal lack of validation and verification models and rarely on any comphrehensive observations and verified data. There has been an increasing and strong reliance in some science disciplines and in their representative discipline’s governing bodies on altered and corrupted data as it supposedly verifies the ideological beliefs of the promoters of that corrupted science. There is an increasingpromotion of claims for which no evidence or proof exists or has ever existed which the governing bodie, the funding bodies , the university science departments in particular and scientific associations have tolerated and even appeared to have given their impramatur to what are not always in retrospect but frequently known at the time as very obviously false and misleading and corruptedly fraudulent science. There will always be science but it may not resemble the industrialised late 20th and early 21st century science of massive output but of a frequently very dubious quality of today . Scientific endeavour may in fact regress and again become the realm of small groups of very dedicated and very astute scientific groups and individuals much as was the case in the late 19th and first half of the 20th century. A situation similar to that which those small groups created almost the entire scientific basis on which our entire civilisation rests today and which was created by what is by today’s standards, very small but quite possibly one of the greatest grouping of intellects of the 19th and first half of the 20th century that had ever existed in this world for centuries past. “A fish rots from the head down” and that is what we are now beginning to see in the increasingly corrupted and industrialised 20th and 21st century science of today. ROM asks the question, and it’s one that has given me cause for puzzlement over the last couple of Months. I’ve often mentioned that for the last nine and a half years I have been writing about matters related to my (perceived) area of knowledge, perhaps one of the most singularly dry and boring things to read about, the generation of electrical power. I now have, (well, lost count really) more than 1000 separate Posts on that subject, and around 1600 Posts in all. After the first Series of 50. I thought I was tapped out, but I just kept going. The more I found to write about, the more I learned, and the more I saw those Posts as dull and boring. As (now) the Senior Editor (of only three, so no big deal that) I have access to the Stats at our site, and I’ve found that some of my Posts average anything up to 10 to 15 visits a day. These last two days have been huge for the CSP Posts, around 200 a day, understandable really with the current interest. All that has amazed me, that people actually have an interest to read that stuff. I also thought that a dry Post with just data about the Base Load would soon have interest fade in it, but even that is still averaging 20 to 30 visits a day, and that of itself is what piqued my interest. I would have Posts with an initial good total for visiting readers, and then fall away, but these Posts are consistent, and in fact improving. People actually do want to read about that. They ….. ‘NOW’ ….. have a desire to find out what actually there might be out there that goes against what they are being told in the media. People will read what is (mostly) at the ABC and then it looks to me that they are going hunting for other information. I’ve also noted ‘chinks’ and doubts about what is being said, not only on what I write about, but on the Science also. It seems to me that people have reached that stage where they are not believing verbatim what they are being told by the Media. I can understand that really. Journalists believe what they are being told, because it is told to them by someone ‘supposedly’ who should know. Because of that, those journalists have no need to follow up and check to see if its correct, because for so long now, everyone has backed up everyone else, so those journalists have gotten lazy, just reporting it verbatim. The same happened with this CSP power plant planned for SouthAus. Journalists believed hand on heart what they were told, not realising that it was being told to them by someone with a ‘barrow’ to push. So, they believed every word, wrote it down as fact and accepted their readers would just flat out believe what they wrote. Doubts have now been sown, across every discipline, and now, people read the initial report, and then go and look for either confirmation, or a second opinion, either way, further information. I think that is the tipping point we have now reached. The average person is now looking for their own information. I even think that some journalists have caught onto this, and are now themselves writing some things that would have been anathema to them, as recently as six Months ago and my perception is that they are looking to cover their, umm, fundament. This is just a personal observation, but things have definitely changed in the last few Months. The method of deception called “The Big Lie” has a short life. Much shorter now than when the politicians controlled all the news outlets and what constituted The News. What they don’t take into account is that reality doesn’t pay any attention to their lies, however big and often repeated they are. What is, is! This fact cannot be escaped. With the internet today, everyone who cares can have a say. That which is true has a much better chance of survival than even The Big Lie. It is now possible for people to find what works so much easier than in the past. Look it up on the internet, try it. If it works, keep it. If it doesn’t, delete it. Simple! Sometimes we get to impatient for the needle of truth to be separated from the mountain of false. Like it or not, it takes time for it to happen. If it doesn’t happen eventually, we will become extinct. This is what keeps it simple. Those who want to live must do the work. Those who don’t want to live, need not do anything and soon they won’t be alive. ROM that was an excellent post, and yes I too believe we are on the cusp of change. I live in a country large town and the global warming climate change stuff is universally derided in a very sarcastic manner, even by check out chicks at the super market. It seems a city centric propaganda thing that has created the followers, many of those with an interest in science are changing their minds. There are always herd followers, these will go to their grave believing humans are evil are causing trouble for Gaia. Main stream physics is also experiencing many hiccups and the imaginary fairies that make their standard models work are being told by many to find another job. Real scientists are once again trying to find answers and not follow the herd. The internet can be blamed for this resurgence of truth, for scientists can exchange both ideas and complex data and really look at the tricky stuff. So, my answer to your post is yes. People living in the shadow of the UK’s only test site for offshore wind turbines are opposing a bid to extend its licence amid claims that the facility is to blame for their ill-health. The National Offshore Wind Turbine Test Facility at Hunterston, North Ayrshire, is run by SSE, the energy company. Its licence expires in October but SSE wants to extend operations by two years. North Ayrshire planning councillors will consider the request on August 23. SSE has already lodged an appeal with Scottish ministers. Locals who oppose the plans claim their lives are blighted by headaches, nausea and insomnia caused by low-frequency noise from two turbines. One of these, the Mitsubishi 7MW Sea Angel, is more than 630ft high, making it one of Britain’s tallest turbines. Rita Holmes, secretary of Fairlie community council, said she and other residents had suffered dizziness, sickness and disturbed sleep. Holmes, who is ***warned of turbine tests by SSE so she can stay with friends or family, said the effect of turbines on human health should be investigated. The wind industry has pointed to scientific studies debunking the idea that infrasound, or low-frequency noise, from wind farms can harm human health. Last week, SSE said an independent consultant had found that low-frequency noise from the Hunterston turbines was “within accepted criteria for the survey and were at a level not expected to cause disturbance”. In 2014, however, the Royal Society warned that the physical composition of the inner ear was “drastically” altered following exposure to low-frequency noise, such as that from wind turbines. Dr John Yelland, an Oxford physicist and acoustic specialist at the Independent Noise Working Group, said it is time “for governments, far too long in thrall of the wind energy industry, to make the effort to understand the real science of wind turbine noise and legislate accordingly”. ***why does SSE warn Holmes about test times, if there isn’t a problem? A few seismographs might just determine where the fault lies. Update Aug. 15, 2017: This appears to be a media stunt to sail the Arctic ocean with the media hook of possibly sailing “even to the North Pole.” The leader of the crew has said: “The secondary objective is to sail as far north as the sea ice safely allows us, possibly even to the North Pole.” BBC reports the ship has set sail on its mission of heading toward the North Pole which current data says is not possible to cross in this sail boat. (LINK) BBC: Pen Hadow sets sail for North Pole as Arctic ice melts. this is the video Morano links to, but it does not have the quote about “secondary objective”. in fact, this video is identical to the second video linked below, which runs for the same time, but has a different headline. as can be seen, summaries of both videos suggest they might sail to the North Pole. have I missed something? or has BBC replaced the video Morano links to with the second video? British explorer Pen Hadow and his crew have set sail from Alaska, in an attempt to become the first people ever to sail to the North Pole. With Arctic ice melting at an unprecedented rate, previously inaccessible waters are opening up, creating the potential for their planned 5,500 km (3,500 mile) journey for the first time in human history. Can 10 men and a dog, led by British explorer Pen Hadow, become the first to sail to the North Pole? It makes it sound like the volcanos have just appeared and they will to the catastrophe. Is there anything they cannot twist and spin to add to their warmist scam? Sorry to go blatantly O/Topic, but at what point did it become OK for the ABC to lie outright about politics? Trump has addressed the press/nation three times on the issue, first condemning all sides, then focusing on the far right, and then all sides once again. In which galaxy can that possibly be interpreted as him supporting one side in this? At no stage did Trump legitimise violence. You can write the ABC, but what is the point? They are beyond their own laws and charter now. Personally I dislike politics intensely. There is so much disingenuous claptrap in the field that I am repulsed by it, but when our taxpayer and supposedly “balanced” ABC starts lying outright it simply has to be called out. What specifically was the lie? You need to spell it out. This is an analysis piece not straight reporting so there is an element of opinion and insight but the opinion needs to be based on facts and observation, and the insight needs to be reasonable drawn from those facts. Not agreeing with the analysis is not the same as the analysis being lies. Fear not mods… I’m not going to derail the topic and continue with this further like writing 22 sentences averaging 50 words each to ask a question with a yes or no answer. The ABC has a strong pseudo Marxist bent, they tweak the news and slant it, with more reinforcement at 7.30 Report and Lateline. Lie by omission, you only give a one sided view to a story to make it news , in other words fake news or standard operating procedure for the ABC and presstitutes the world over . What place does the ABC have simply hiding behind “opinion” pieces to keep pushing a one-sided agenda? But to the lie. There is no way that condemning all political violence (“from all sides”) can be read as endorsing aka legitimising violence from one side, namely the white nationalists. That is exactly what the headline says. It is a lie. It is that simple. BTW I am trying to synthesise an overview of what has been going on in the online sphere (mainly Youtube and associated facilities) over the last 6 months to a year. There are a lot of thoughts to mould into a coherent story. I aim to post at length on the next unthreaded post. That’s if there is an interest. It helps to explain why we ended up with Charlottesville and other such incidents. I have no problem you asking a genuine question Gee Aye, but I trust you are receptive to genuine answers, otherwise we would all be wasting our time. Bd, if you are going to submit what you just wrote or ask others to submit, you need to be clearer about what the lie is. I think anything as vague and containing loaded accusations will get the response it deserves. Liberating Tolerance. Completely tolerant to the left and completely intolerant to the conservatives. Part of the Cultural Marxism found in Universities and the school system. Cultural Marxism’s Critical Theory is to criticise the right every opportunity available. ABC etc particularly journalists schools are in on this. It has been standard practice for the press and news services to put a slant on the news released by omission. This is the way propaganda operates, lately with the internet people are seeing the truth and the newspapers and other news services are loosing customers. ACA the Age even the seven mob and are loosing money and the share prices dropping, people are waking up to the distortion and propaganda. Denial begins to look like psychosis. Deniers just keep on denying. “THIS PROJECT, ARCTIC MISSION, IS NOT ABOUT TRYING TO REACH THE NORTH POLE. I THINK IT’S REALLY IMPORTANT THAT PEOPLE UNDERSTAND THAT. OF COURSE, THE HEADLINES SOME PEOPLE HAVE BEEN READING ABOUT ARE ASKING WILL WE GET TO THE NORTH POLE OR NOT AND, OF COURSE, IF WE DID, THAT WOULD BE SENDING A MIGHTY MESSAGE OF A CHANGING ENVIRONMENT UP HERE. THE ENVIRONMENT IS CHANGING ANYWAY”…BLAH BLAH. at one point, Erik De Jong (skipper and co-leader) says weather forecasts are unreliable. nice. In the coming hours, the Arctic Mission team will set sail from Nome, Alaska. shame on BBC, NPR, Miami Herald and all the rest of the FakeNewsMSM who have hyped up this trip, and good luck to the adventurers, whatever their motives. hope they get well soon. The evidence is conclusive, geothermal heat flux is a natural phenomenon. “For ages scientists have been using our graphs and our data and our facts to try to communicate our science but it’s been demonstrated that this doesn’t really work very well,” Dr Verges says. “It very rarely influences people’s opinions and hardly ever motivates action. ***Collee, who is also a director of the climate action group 350.org Australia, already has some ideas. “There are whistleblower stories about the way fossil fuel companies have hidden information from the public,” he says. “There are stories about scientists being targeted and discredited deliberately because of the financial value of what they know. “Ironically, people sit around in Hollywood try to work out ways of creating a story about an evil genius trying to destroy the planet,” he says. if only they could control Twitter! When An Inconvenient Truth opened in 2006 it was generally supposed we had a window of two or three decades to deal with climate change. Last year that shrank to a decade. Last month Australia’s chief scientist, Penny Sackett, told a Canberra gathering that we have six years to radically lower emissions, or face calamitous, unstoppable global warming. Six years. Given that this problem is usually described as a process unfolding over centuries, how can it be that things have spun out of control in such a short time? The worst case scenarios of the Intergovernmental Panel on Climate Change, dismissed a mere three years ago as remote possibilities, are now given very short odds: the death of the Murray Darling, the drying of southern-east Australia to a tinderbox, the increased flooding in low-lying areas, the defrosting of the Siberian tundra, the dramatic loss of rainforest and the break-up of the Antarctic ice shelf. All these things are happening as predicted but – if you believe the evidence – at several times the expected speed. I do believe the evidence. Which leads me, personally, to the bleak conclusion that the human race is stuffed. The current financial crisis is merely the curtain raiser to a grand opera of social and ecological collapse. Our children – forget our grandchildren, I’m talking about my own kids, aged 14, 11 and 9 – are going to live in a world in which major cities are flooded, fertile plains become deserts, populations run out of food and water, rivers run dry, fishing grounds become dead zones, our rainforests and living coral reefs become curiosities of history. funny how this SMH piece was pre-Climategate. and Collee, and the rest of them, have learned nothing. These volcanoes might very well stop the ice flowing out. The West Antarctic glaciers have reduced in area from their edges under cut by deep warm water circulation. Some had been increasing as late as 70s. Try google.